Venezuela will receive a loan of $5 billion from China in the coming months for crude oil projects, a director at state-owned Petroleos de Venezuela said on Tuesday. China has become Venezuela’s principal financier over the last decade, lending more than $46 billion to be repaid in oil. “It is being discussed right now and will come within a few months,” Orlando Chacin, vice president of exploration and production at PDVSA [PDVSA.UL], said in an interview. The resources should help the oil company as it handles the severe impact of the drop in crude prices. Oil makes up 96 percent of the country’s foreign income. The funds seemed to be part of an overall $10 billion loan a PDVSA source earlier this year said Venezuela had negotiated with the Development Bank of China, half for oil projects. “They are for many projects,” Chacin said. He said many of those would be in the vast Orinoco Belt, which contains most of Venezuela’s crude, but did not offer more details. Venezuela is looking to increase crude production in the Orinoco region to offset declines in other traditional areas and to stimulate its struggling economy. The country’s international reserves hit 12-year lows this month as the economy suffers a recession, high inflation and shortages of basic goods. via Venezuela to get $5 billion in funding from China in next few months: PDVSA official | Reuters. Russia‘s freezing north has never been the most welcoming place for foreign travelers, and its onshore oil riches have always been state secrets. But when the order comes from the Kremlin to open up, people obey. Last September, President Vladimir Putin, who has been seeking new markets in Asia for Russian energy exports to replace traditional customers in Europe, announced that he would welcome Chinese investment in Vankor, a vast new oil field in remote eastern Siberia owned by state firm Rosneft. Since then, delegations from both China and India have been flown out to visit the field in the remote tundra. Some of the workers, who spend four weeks at a time at the isolated station – where temperatures can fall as low as minus 60 Celcius (minus 76 Fahrenheit) – have duly taken up Mandarin. “No problem. We will work with the Chinese workers if need be,” said Alexei Zyryanov, deputy head of an oil and gas production unit. All of Vankor’s output of 440,000 barrels per day of crude is already shipped east, via the East Siberia-Pacific Ocean pipeline, which includes a spur feeding China’s northeast. But a proposed Chinese investment in a stake in the project would go far further than Moscow has ever gone before to luring Beijing into its hydrocarbon industry. Rarely has Moscow considered offering an ownership stake in such a big strategic onshore deposit to outsiders, despite decades of interest from Western majors. The offer is the more remarkable for being made to China, a rival for decades with which Russia nearly went to war in the 1960s over a border dispute. Rosneft confirmed that it has reached a draft agreement to sell a 10 percent stake in Vankor to China. via Learning Mandarin in the tundra – Russia invites China into oil business | Reuters. China National Chemical Corp (ChemChina) is close to becoming the biggest single shareholder in Pirelli (PECI.MI) in a deal that would trigger a 7 billion euro ($7.5 billion) buyout of the Italian tire company. Three sources familiar with the deal, which would be the latest in a string of Chinese investments in large Italian companies, said ChemChina was discussing a deal with Pirelli’s top shareholders to buy a holding company called Camfin, which owns 26 percent of Pirelli and is 50 percent owned by Russia’s Rosneft (ROSN.MM). Without identifying the possible buyer, Camfin said it was in talks with an international industrial group to sell its Pirelli stake at 15 euros per share, valuing the tire group at 7.1 billion euros. It said the stake would be transferred to a vehicle controlled by the new partner, after which a takeover offer for the rest the world’s fifth-largest tire maker would ensue. If the offer succeeds, Pirelli will be delisted. The deal comes as Pirelli’s rivals Michelin (MICP.PA) and Continental (CONG.DE) look around for growth opportunities in Asia. State-controlled ChemChina and Rosneft declined to comment. Previous Chinese investments in Italy include State Grid Corp of China [STGRD.UL] buying into electricity grid company Terna (TRN.MI) and gas network operator Snam (SRG.MI). Besides Rosneft, Camfin’s owners are a holding company comprising Pirelli chief Marco Tronchetti Provera as well as Italian banks Intesa Sanpaolo (ISP.MI) and UniCredit (CRDI.MI). via ChemChina close to Pirelli deal that would trigger buyout offer | Reuters. Fox News: “Russian oil giant Rosneft and Chinese state firm CNPC signed Friday a $270 billion deal to supply China with oil over 25 years as Russian President Vladimir Putin pushes to diversify the country’s energy customer base away from Europe. The agreement between Russia, the world’s largest energy producer and China, the world’s largest energy consumer — one of the biggest deals in the history of world oil industry — was signed by Rosneft chief executive Igor Sechin and CNPC head Zhou Jiping in the presence of Putin. “An estimated value of the contract in current market parameters is absolutely unprecedented — 270 billion dollars,” Putin said in a speech to investors at the annual Saint Petersburg International Economic Forum after overseeing the signing of the deal together with visiting Chinese Vice Premier Zhang Gaoli. Under the deal, the heavily-indebted Rosneft is slated to receive an upfront payment of around $70 billion, Putin said. Under another deal, CNPC will acquire 20 percent in an Arctic liquified natural gas project in which France’s Total has 20 percent and Russian independent gas firm Novatek holds the rest. Putin has made a priority of stabilising Russia’s sometimes prickly relations with its giant eastern neighbour at a time when its ties with the West are becoming ever more problematic. Russia wants to diversify its base of energy customers away from crisis-hit Europe and is aware it has not fully exploited the colossal potential of Asian markets, China in particular. via Russia, China sign ‘unprecedented’ $270 bn oil deal | Fox News. Reuters: “Rosneft is seeking to borrow up to $30 billion from China in exchange for possibly doubling oil supplies, making Beijing the largest consumer of Russian oil and further diverting supplies away from Europe. Four industry sources familiar with the situation told Reuters Rosneft was in talks with China’s state firm CNPC about the borrowing, which would echo a $25 billion deal the two companies clinched last decade. 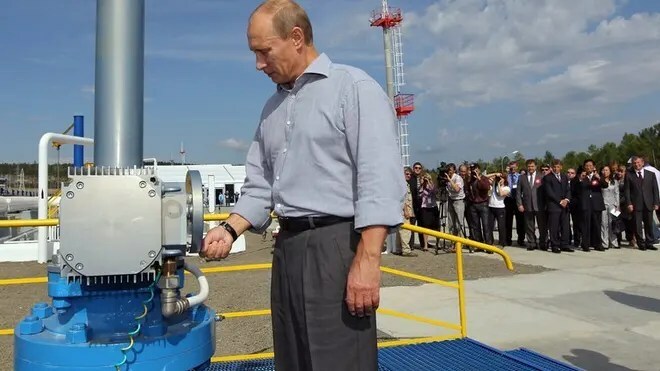 Back then, Rosneft and Russian pipeline monopoly Transneft borrowed money to help Rosneft acquire the assets of nationalized oil producer YUKOS while agreeing to build a pipeline to supply China with 300,000 barrels per day for 15 years. This time, Rosneft wants to borrow money as it is close to completing a $55 billion acquisition of rival TNK-BP to become the world’s largest oil producer among publicly traded firms. Russia’s leading oil company, controlled by the Kremlin, is considering ultimately doubling supplies to China, sources said. “It can be a combination of delivery options. The strategic line is to increase supplies to China,” one source familiar with the situation said. “The reason why China is willing to lend is simple. They sit on over 3 trillion of dollars in reserves and are looking to diversify their investments,” he added referring to China’s forex reserves of $3.3 trillion. via Exclusive: Russia plans $25-$30 billion oil-for-loans deal with China | Reuters.